I Speak Melsh: Liberate Your Art: the blog hop! 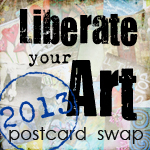 Liberate Your Art: the blog hop! Thank you, garden trellis - you make a great postcard display frame! And the withered brown stalks also visible show both how late spring is this year, and how poor a gardener I am!! And my final photo? Ah, yes - I didn't have a photo of the back of my own cards to share when I first mentioned this project, so here it is now. I had a printed greeting - which is my message to all of you reading this now! - and I added a handwritten note to each card, too. Oh, yes ... I'm definitely signing up for next years swap! I LOVE Mail Call! :D :D Lovely variety of cards. Love what you sent and what you received. This was a lot of fun. I'm already thinking about next year! What beautiful careds you received, Mel, and I love the way you have photographed and displayed them in this post! Lovely! I'm definitely signing up again next year -- this was a wonderful experience. Great collection! I love the way you displayed and photographed them. Great blog, I'm so ready for next year. I adore the back of your card...super cool! Awesome job keeping the postcards a secret, I don't know how you did it! Here's to next year, I'm ready. I will definitely be joining the fun again next year. It was great! Yes this was fun wasn't it. I saw your card on the blog hop, It made me feel all fuzzy! Yes, I'd definitely do it again! Mel, I received your beautiful card - and I totally love your "Melsh". I looked around a little bit on your blog, I really like your place! Loved getting your card and happy that you got some cards that I got, too! The VA road is from Kathryn von Rooyen... she's delightful! Looking forward to next year's swap! What a fabulous project :) I'll definitely look out for it next time. I've been hoping around admiring the results of this project on various blogs and I'm just blown away by it: the beautiful art and the time and care which have gone into making such a large effort such a success. Yes, I intend to sign up next year too. It was such fun, and I learned a lot about what is involved in printing a nice postcard. All the cars you received are great! I plan to be back next year, too. This was my 2nd year. Can't wait for next year...this has really been a treat. I love what you've received. Take care until next time! What a great collection - and you did a really nice job of documenting what you received. All lovely! Very nice post! This has been fun! That is a fantastic array of cards Mel - it must have been wonderful to receive each one! Wonderful post about the swap and lovely artwork you received. I'm definitely gonna do it again next year. Great selection of postcards, love them ALL! I love how you've presented both the front and back of the postcards here. What fun to get these in the mail! I'll definitely be back next year, too. YOu got some great ones! I especially like the moose, the painting supplies and the writer. I have a feeling your postie will miss your stalking! So great to have you in the swap this year. And yes, I must thank YOU, because without each and every one of you, there would be no swap!! such a great post. (I think you write quite well!) It was such fun to see and 'meet' fellow artists from all over. Your cards are wonderful. What lovely cards and I love that Rousseau quote and the photographer's one too. Off to see your own work :). Definitely signing up for next year's swap too!! Love the set of cards that you received, I just keep seeing that moose! What a gorgeous collection! This swap was so much fun - both making and receiving cards! Lovely collection! I got a kick out of your dictionary!